January 21, 2019 at 10:37 pm. 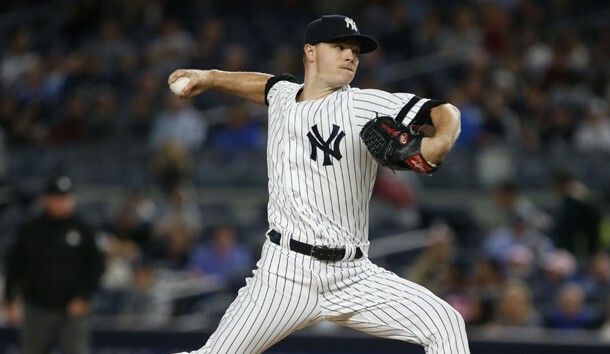 The Cincinnati Reds acquired right-handed pitcher Sonny Gray from the New York Yankees in exchange for infielder Shed Long and left-handed relief pitcher Reiver Sanmartin. Gray, 30, also agreed to a new three-year extension with the Reds that runs through 2022, with a team option for 2023. The Reds announced the trade Monday afternoon. In 30 appearances last season, which included 23 starts, Gray went 11-9 with a 4.90 ERA and 123 strikeouts in 130.1 innings pitched with the Yankees. Opposing hitters hit .270 of Gray. He averaged 8.49 strikeouts per nine innings. Over a six-year career, Gray has a 59-52 record with a 3.66 ERA and 789 strikeouts in 900.2 innings pitched. In 2015, he was an American League All-Star with the Oakland A’s. He went 14-7 with 169 strikeouts and a 2.73 ERA in 208 innings pitched. He ranked third in the AL in opponent batting average for a starting pitcher (.217), third in ERA (2.73) and 13th in strikeouts (169). Gray should bolster a Reds rotation that’s already added Alex Wood this offseason. But it will be interesting to see how Gray and Wood adapt to Great American Ballpark, a known hitters park. If Gray can return to his All-Star form while with the A’s, he could be a major addition to Cincinnati’s rotation.